Gagaku bezeichnet die älteste musikalische Aufführungspraxis Japans, unterteilt in höfische Musik aus dem eigenen Land und der von der chinesischen Tang Dynastie (618-907) übernommenen Musik. Der Leiter des Ensembles, Tadaaki Ōhno, stammt aus einer der wenigen Familien, die bereits im 11. Jahrhundert das Gagaku-Aufführungsprivileg besaßen. Die Ausbildung ist streng. Acht Jahre musste Tadaaki die klassischen Werke ohne Instrument auswendig lernen, bevor er als 17-Jähriger beginnen durfte, die Sho zu blasen, eine Art Mundorgel mit 17 Bambuspfeifen. Zu den Gagaku-Instrumenten gehören außerdem die Flöten Ryuteki, Komabue, Hichiriki, die Zither Koto, die Laute Biwa und verschiedene Trommeln. Auch ohne Kenntnis der Tradition ist die strenge ritualisierte Form der oft kurzen Stücke hörbar. So fremd die Klänge erscheinen mögen, man merkt, jeder Ton hat seinen festgelegten Platz und seine besondere Bedeutung. Gagaku is the oldest of Japan's performing arts, with a history of more than 1000 years, and is the oldest living ensemble music in the world. In its contemporary sense, the term gagaku signifies the whole body of classical Japanese music and dance performed by the musicians of the Kunaicho Gakubu (Music Department of the Imperial Household Agency, Tokyo). Tokyo Gakuso is a relatively young group, founded in 1978 in response for the need for a group of expert gagaku musicians able to deal not only with traditional repertoire, but also with the challenges of contemporary pieces for the gagaku ensemble. Its forerunner, the Shigenkai, was formed in the late 1950s by musicians of the Music Department (Gakubu) of the Imperial Household Agency (Kunaicho), Tokyo, as a means to promote the public's appreciation of the ancient art through activities outside their official duties at the Imperial Palace. Tokyo Gakuso was named by Toshiro Kido, at that time producer at the National Theatre in Tokyo, and its founding music director was the sho specialist and Imperial Palace musician, Tadamaro Ōno. After his death in 1994, his place was taken by his nephew Tadaaki Ōno, the present music director. Like other members of the Imperial Palace group, Tadaaki Ōno has spent a good deal of his life studying and performing on several of the instruments, the dance, and the vocal music of gagaku. Born in Tokyo in 1959 into the Ōno family, one that traces its geneology back to the late ninth century, and that has been involved in the hereditary transmission of the art since at least the tenth century, Tadaaki may have been fated to carry on this tradition. Since its formation, Tokyo Gakuso has been very active in the performance of new compositions, as well as long and rarely heard pieces from the classical repertoire. This CD marks the first time that the musicians of the Imperial Court of Tokyo have recorded for a nonJapanese record label, and as such is an essential addition to the Celestial Harmonies catalogue of important cultural documents. 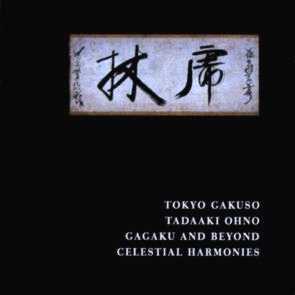 The pieces on this CD, performed by a full gagaku orchestra of up to 16 musicians and over 20 instruments, are set out in an order that reflects the typical structure of the regular spring and autumn concerts given by the Palace musicians, which are open to the public. The first half of these concerts is made up of a kangen performance: several togaku pieces in one of the six togaku modes, sometimes with a saibara or roei. On this CD we have three pieces in the mode hyojo together with the saibara Koromogae. The second half of the concerts at the Imperial Music Department is composed of a bugaku performance, as a rule two dances: a togaku (or 'Left') dance followed by komagaku (or 'Right') dance. On the CD we have the togaku dance Ryoo and the komagaku dance Hassen. The CD finishes with the rhythmic togaku piece Chogeishi, which has traditionally been played at the conclusion of a dance performance. This rare and important recording has been put together at the very highest level of expertise. Booklet annotation is provided by Associate Professor Steven G. Nelson, the only Western member of staff at the new Research Centre for Japanese Traditional Music, Kyoto City University of Arts, Kyoto, Japan. 1 Kangen: Hyojo no Netori 1'40"
3 Kangen: Etenraku nokorigaku sanben 12'56"
7 Sadacho no Netori 0'50"
8 Tokyoku no Ha 7'32"
13 Tokyoki no Ha 8'45"
14 Tokyoku no Kyu 4'18"
15 Bugaku: Taishiki-cho no Netori 1'33"